The Indian Basin Trail is located within the Princess Campground. It’s a 2/3 of a mile loop trail which is ADA and stroller accessible. The trail is completely paved. 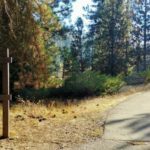 There is an additional 1/3 mile trail that is not paved, but still ADA and stroller accessible. This trail offers great views of meadows and numerous giant stumps to see and explore. The trail is partly shaded and completely flat. There are lots of big stumps to explore. Picnic areas and campsites are also available at this location. $35 entrance fee into the park, or you can purchase a year pass. This trail is located within the Princess Campground in Kings Canyon National Park. If the campground is open, drive in and go left to the trail head parking lot. 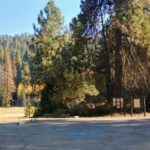 If the gate to the campground is closed, park near the gate, without blocking it, and walk in and go to the left to the trail head.